Is 'The Catch' Joe Montana's greatest moment? Published: June 11, 2012 at 02:40 p.m. Updated: Aug. 4, 2012 at 03:50 a.m. 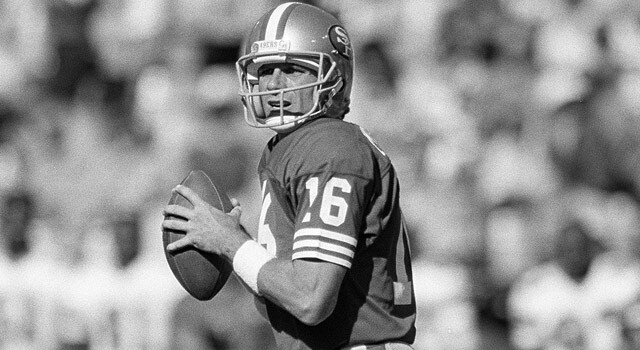 Happy birthday to Joe Montana -- the greatest quarterback who ever lived. Although, many of you who were on the business end of a Montana comeback might not have many well wishes. In fact, Montana ruined one of my birthdays when he tossed two 90-yard touchdown passes to John Taylor in 1989 to knock off the host Los Angeles Rams. But let's take some time to celebrate the greatness of Montana by looking at his six greatest moments. Just missing the cut were his rally against the Bengals in 1987 and Eagles in 1989, returning from back surgery or his hilarious appearance as a co-host of "Saturday Night Live." And for a lot of quarterbacks, the savage beatdown of the Bears in the 1988 NFC Championship might have made a list like this. But not Montana, the greatest of all time. Montana left San Francisco for Kansas City in 1993, and many believe the 49ers might have acted too quickly. Montana led the Chiefs to consecutive playoff appearances in two seasons, but one of his most satisfying wins came when he knocked off his rival in Week 2 of the 1994 season. Montana was at his best in the big games, and some might argue this is the most impressive of all of his Super Bowl performances. Montana won his fourth Super Bowl and third MVP award when he threw for 297 yards and five touchdowns against the Broncos. There was a big buildup for Dan Marino, then a second-year quarterback for the Dolphins prior to Super Bowl XIX, but Montana left no doubt who was the best quarterback in the game. Montana set a Super Bowl record with 331 passing yards, had three touchdown passes and rushed for another. Some might consider this one of the best regular-season games of all-time. Montana outdueled John Elway in this clash on "Monday Night Football" in 1994. Montana passed for 393 yards and three touchdowns -- the last a 5-yard toss to Willie Davis to rally the Chiefs for a 31-28 victory in the closing seconds. Many football enthusiasts didn't give the 49ers much of a chance in the 1981 NFC Championship Game, despite San Francisco's early season victory over Dallas. The Cowboys held a 27-21 lead late in the fourth quarter, but Montana's 6-yard pass to Dwight Clark launched a dynasty. As Montana stood in the huddle prior to his winning 92-yard drive against the Bengals in Super Bowl XXIII, he pointed out John Candy to all of his teammates. Moments later, after he dissected the Bengals defense, Montana capped the 11-play drive with a 10-yard touchdown pass to John Taylor with 34 seconds left. Hit up Rank with your Montana memories via Twitter or via Facebook Also be sure to catch the latest on the Dave Dameshek Football Program. "Worst kicks in NFL history..."